If you need to buy some thermal underwear, then there are one or two things you need to be armed with before visiting the store to purchase. Do not feel that you have insufficient knowledge about this type of garment and that you might go wrong somewhere and end up with a less desirable product. We have your back, and you can be very confident that we shall guide you through and you’ll be competent to do it on your own after reading our extensive review. We have discussed below some of the major features that you should consider for purchasing the best thermal underwear; we have also reviewed some of the best products that you can find on the market right now. Our primary objective is to equip you with some of the skills that you need to purchase the best long underwear and make an informed decision about why you are going for a particular thermal underwear and not the others. Don’t forget that we address both newbies and experienced adventurers willing to spend their nights in the cold while exploring the wilderness and are looking for the outdoor underwear. Thermal underwear can generally be considered as a second skin that creates an insulating layer between the fabric and your body. The thermal underwear fit is very important as it will determine how comfortable you will feel while out in the wilderness. If you will be mostly spending your time in warmer conditions, your underwear should be loosely fitting. On the other hand, in cold conditions, a snug-fitting underwear will be ideal because it will trap the heat that your body generates hence boosting your comfort. If the underwear fits poorly, then it is likely to create hot pockets rather than distributing warmth evenly and this will surely make you feel some discomfort. If you choose a form-fitting underwear, then such a predicament is something you should never even think of. Your underwear should also have a slick outer surface to prevent your other clothing from sticking to it. When dealing with thermal fabric, there are two components that you should consider which are material and weight. When we narrow down to the weight of the thermal underwear, we can have four sub-categories which include the ultra-light weight, lightweight, midweight and heavyweight. Ultra-light weight is suitable to be used in mild to cool outdoor conditions. If you want to use your underwear in a cool to moderately cold weather, then go for the lightweight underwear. If you will be spending your time in moderately cold or extremely cold weather, then it is advisable to go for the midweight underwear. As for the heavyweight underwear, you will need them when adventuring in extremely cold and frigid temperatures when a lot of warmth is necessary to control the temperature of the body. Under the material used to make the fabric, we have synthetic underwear fabric made for extremely cold conditions, wool underwear fabric which provide an optimum balance of your body temperature and manages moisture very well, silk underwear fabric ideal for activities in moderately cool weather conditions and cotton underwear fabric which may be cheap but is least preferred because it is uncomfortable. There are several questions that you should ask yourself before buying a thermal underwear. Do you need the underwear to use on a daily basis to provide warmth or improve your freedom of movement during a physical activity or just to prevent the loss of body heat in very cold temperature? Basing on function, you can consider warmth, stretch, bacteria resistance, loft and moisture wicking. Under warmth, you should go for a garment that will help in regulating your body temperature effectively. If you consider stretching, then you should avoid cotton underwear because cotton does not stretch uniformly so you should go for underwear made from the other fabrics. When you cannot shower on a daily basis then going for an underwear with high bacteria resistance in necessary. You should also consider the moisture wicking functionality of the underwear because the main purpose of the underwear is to make you feel comfortable and if it cannot wick moisture then you will be mostly uncomfortable. Thermic underwear can be categorized under styles into two basic groups. These are the one piece and the two piece suits – with each piece usually bought separately. Both of these styles of thermal underwear can be close fitting and can be contoured to fit your body perfectly; they can also be loosely fitting. The type of fabric determines the style of the thermal undergarment. A piece of fabric with some cotton blend is likely to yield a garment that has a loose fitting while the microfibers will tend to be more form fitting and will keep their shape better as compared to the cotton types. If you read the manufacturer’s note, you will realize that some thermal underclothes require specific care. Some people may find it hard to follow these specific instructions and will, therefore, go for a thermic underwear that needs just basic care instructions. Most cotton thermals should be washed in cold water so that the fabric does not shrink and should be dried in air for best results. Silk thermic underwear should be hand-washed or washed using the delicate option if using a washing machine. Synthetic fabrics can easily be cared for and dry very quickly. You can also wash them inside out for best result using warm water. These are some of the care guidelines that are associated with various types of thermals and to be honest, not everyone will be comfortable with specific care guidelines when it comes thermal underwear. So depending on which care practice you prefer, it will be easy to decide on which thermal underwear to buy. Below we have listed some of the top-rated thermal underwear brands you can find on the market right now. We checked their features and reviewed their pros and cons so you can make an informed decision. 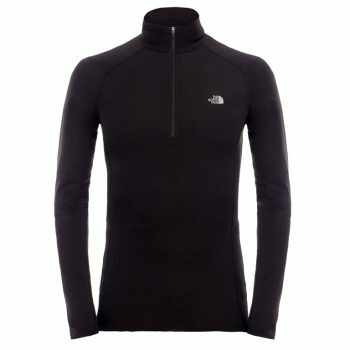 The North Face Warm Base Layer Top is one of the best underwear that we recommend for outdoor use. 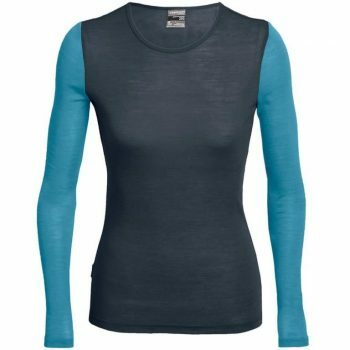 This base layer top is ideal for anyone who’s spending their time outdoors for a long period of time and even for those who are doing any physical fitness training. This thermal underwear comes in various sizes and can fit almost anyone. If you have a family and you want to enjoy your time outdoors with your family members, then you don’t need to be worried as there will always be a perfect size for everyone. It is available in small, medium and X-large sizes. Most people prefer various colors for different reasons and this thermal underwear has almost all the colors you may want to choose from. If one color does not please you, then you can go for another color. There are the TNF black color, Cosmic Blue and Monument grey colors. This thermal underwear can stretch easily because it is made using 100% HyActive polypropylene fabric. You’ll also be very comfortable while using this thermal underwear because it is very good in moisture wicking. With a front zipper that stretches from the chest up to the neck region, you can easily control the amount of heat that your body maintains by closing the zipper when feeling very cold and lowering the zipper when doing some physical exercises. The price at which this thermal undergarment can be bought is budget-friendly and therefore this means almost any average person can afford to buy one. This 5-star thermal undergarment is ideal for keeping you warm while in the wilderness. With the hood, your head will be protected from the cold and have better heat retention. 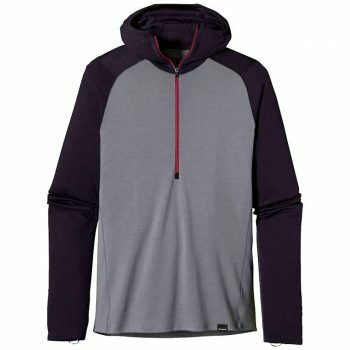 The Patagonia Merino 3 Mw Hoody will make sure that you enjoy your outdoor activities without breaking a sweat. Manufactured using a synthetic material, this product should keep you nice and warm. It is also very easy to wash and dries very quickly. It is also very durable and can be used over and over again before thinking of replacing it. No one would like to spend their money now and then buying the same product and therefore being that this thermal underwear is very durable, it will save you from spending your money most of the times buying the same product. Available in a black color that many people prefer, this thermal underwear is bound to become a darling to many. If you want value for your money, then this is the thermal underwear to go for. You will be very comfortable outdoors and will always stay warm. Furthermore, you can use this thermal underwear for up to six days as you hike in the wilderness without any hitches. This thermal underwear is also very efficient in moisture wicking, and this means even if you sweat while hiking, you will not feel uncomfortable because the thermal underwear will take care of the sweat. At an affordable price of approximately $97, this is the thermal underwear that any serious adventurer should budget for and purchase so as to have fun enjoying their hobby in the wilderness. One of the most amazing features of this thermal underwear is that it is very versatile and can be used in very many areas. Completely efficient and designed with high quality in mind, the Icebreaker Men’s Oasis Crewe Top is a thermal underwear that will perform beyond your imagination in icy conditions. This thermal underwear literally means the difference between life and death when enjoying your adventurous activities outdoors in icy conditions. If you are looking for comfort in cold areas, then this is the best choice for you. Let us now look at some of the great features that make this thermal underwear to stand out from the rest. First of all, as an adventurer, you wouldn’t want to carry so much weight to your adventures, this is why this thermal underwear weighs very less to reduce the weight that you will carry on your backpack. It weighs only 12.2 ounces. What’s more, the 100% merino wool fabric will mean that you will always feel warm in the icy conditions. To prevent back rub, this product features the offset shoulder seams that work perfectly to yield the required performance. The availability of the anti-chafe seams increases the level of comfort provided by this thermal underwear. It also has a drop-tail hem that is useful in providing added coverage. It fits very comfortably being that it is a slim fit thermal underwear, it is capable of wicking away moisture perfectly and amazingly absorbs odor. Because it is made out of wool, it requires a lot of attention when it comes to maintenance. There are specific guidelines that one has to follow when using this thermal underwear which include hang drying and cleaning it correctly. It is somehow expensive though because it is made using merino wool, but it is very durable. This 5-star thermal underwear is among some of the lightest items we’ve reviewed so far. Weighing just 6.7 ounces, this item is suitable to be used by any outdoor adventurer out there. The Patagonia Capilene Midweight Crew fabric hits the sweet spot of breathability, weight and moisture wicking that if worn alone or with additional layers provides a genuine meaning of versatility. This item will keep you dry and comfortable especially when worn while performing high-exertion activities in cool and moderate temperatures. It is also capable of insulating beneath a shell of air while in cold weather. 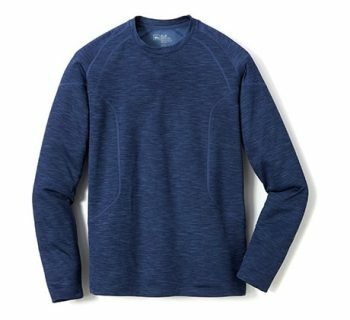 Constructed with a Polartec Power Grid fabric, this item has a smooth face ideal for easy layering; it also has a brushed-back grid that is helpful in wicking as well as keeping warmth. The fabric used to construct this item is blue sign approved, features a 93% recycled polyester content and has been treated with Polygiene permanent odor control. This makes sure that this item doesn’t produce funny odors when used. Its breath-taking features that make it unique include a full underarm gussets used to provide unhindered shoulder mobility, a rib-knit collar having an internal neck tape for chafe-free comfort, elastic thumb loops for secure hand coverage, flatlock seams for minimization of chafing, offset shoulder and side seams to lie smoothly beneath pack straps, as well as a drop tail for additional coverage. This item is available in various colors and certain sizes. This 4.8-star thermal underwear is one that you should have as an outdoor adventurer. The Smartwool Men’s NTS Mid 250 Crew is obviously the warmest item we’ve reviewed so far. We decided to recommend this product because it has very great features that a perfect thermal underwear should have. It has an improved design that will make sure that you are as comfortable as possible while in the wilderness. With the chase-free seam construction together with the flat-lock seam construction, this product has been designed to eliminate chafing as much as possible. 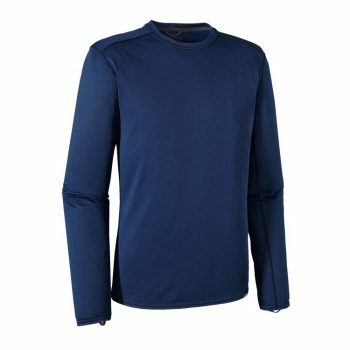 This item has the warmest base layer that works as a single layer in cool weather and as a base layer in cold weather. If your skin is very sensitive to wool, this item is ideal for you because it is very soft and will never irritate your skin. For those who are into ultralight packing, sadly this item will prove to be a bit heavy, but if you are not into ultralight packing, then you are ready to go. What is even more appealing about this item is the fact that it is available in a variety of colors so you can choose your favorite color. 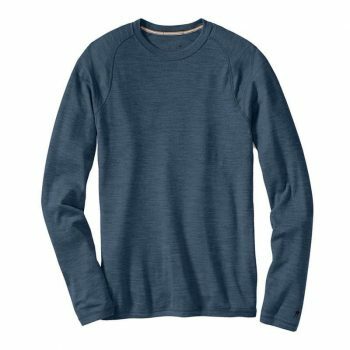 Due to its excellent flexibility as well as moisture control, the men’s REI Long Underwear Crewneck Shirt is, of course, an outstanding choice for a broad range of activities carried out in cool conditions. This product is one of the best products that you can purchase on the market right now. It boasts of very many appealing features that will make you fall in love with it. Its fabric has a UPF 50+ sun protection rating meaning that when you use this item, there are close to zero chances of suffering from sunburns. The 4 way stretched polyester fabric does not stop at sun protection alone but goes ahead to wick moisture from your skin and dry faster so that you don’t feel chilled or clammy. The brushed inner surface of this item is very warm and soft. With the non-chafing flat seam construction as well as the shoulder seam placement, the levels of comfort that you will experience under pack straps will be on another level altogether. This shirt will stay tucked in because of the extended lengths, and the smooth outer surface will easily slide under other layers. What’s more, this shirt has a next-to-skin fit that appears to be hugging the body to yield optimum performance. It is also available at a pocket-friendly price that should be affordable to almost everyone. This 3.7-star thermal underwear is unique because so far since we started reviewing these products; it is the only item that comes in very many colors. It comes in almost 8 different colors, and you can be spoilt for choice if you don’t know which particular color you want because they are all appealing colors. The Ibex Men’s Woolies 2 Crew Shirt is a high-quality thermal underwear that weighs much less when compared with other thermal underwear. Several features make this product to stand out from the rest like the 18.5 superfine wool yarn that offers a very warm, close to the body fit that will move with you while keeping its shape too. The mid-weight interlock fabric performs excellently well as a base layer as you enjoy your adventures. This thermal underwear is ideal for traveling as it is naturally odor resistant and will always hold its shape. Tired of hand washing your thermal underwear? This thermal underwear is machine washable and therefore instead of spending much time hand washing it, you can simply machine wash it. 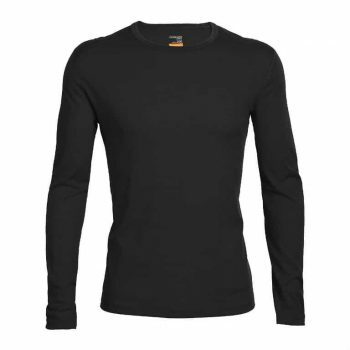 If you are having an event where you may need a great base layer, then this item should be your first choice because it is made using moisture repellent wool. This item has been crafted in a number of options for various bodies and conditions to yield the highest level of functionality next to the skin. This 4.4-star thermal underwear provides an all year round comfort in any weather. The Icebreaker Women’s Long Sleeve Crewe is perfect for sporty and casual activities. 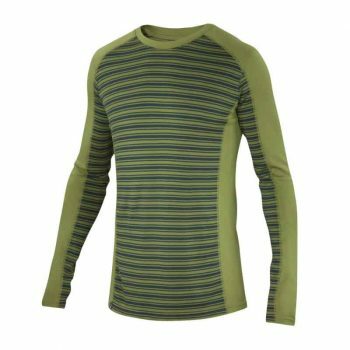 This product has very many appealing features like the highly breathable 200 g/m² merino rib fabric feature that ensures that the product cools the body in warm weather and insulates the body in cold weather. What’s more, the product features the flat lock seams that prevent chafing; forward side seams for more comfort and a self-fabric binding at the neckline. This thermal underwear is also soft and warm making it comfortable to wear. Some reviewers complain that it is not as thick as it should be and therefore consider it to be of low quality. It is also 3-4 inches shorter than the regular Icebreaker shirts and is generally smaller in size. This shirt does not stretch much but is somehow cheaper. Finally, we have come to the end of our review of the top-rated thermal underwear available in the market. It is our hope that you can now confidently shop for an undergarment that fits your needs and requirements. If you are in the market for an underwear for outdoor use, you can’t go wrong with any products that we have reviewed above. Which product has caught your eyes? Have you used any of the brands that we discussed above? If so, please feel free to let us know in the comments section below.